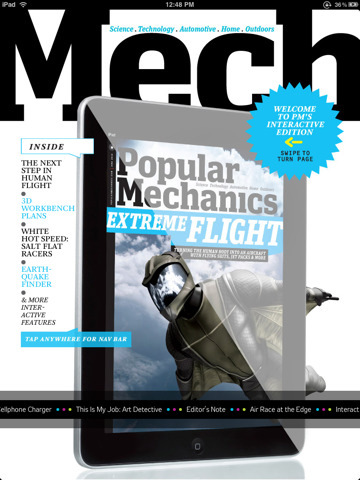 This exclusive iPad edition of Popular Mechanics delivers all of the readability of the print magazine, while showcasing interactive features that are only possible on a touchscreen device. In addition to delivering great stories, our special issue demonstrates what’s possible in a digital version of Popular Mechanics. -An interactive earthquake map that downloads and displays the most recent seismic activity in the United States. -An animated fly-through of a Red Bull air race. -Exclusive video from Bonneville Speed Week. -DIY plans for a home power-tool charging station, with 3D models and animated step-by-step instructions. And this is just the start: We want your feedback and suggestions to help us prepare a monthly version of the magazine this fall, packed with even more content and more functionality. So enjoy reading, and make sure to send us your thoughts.